Update: The sermon has now been digitized in full and can be seen here. Fred Shapiro, associate director of the Yale Law School Library, recently brought to our attention an important and possibly unique sermon in Houghton’s collections. 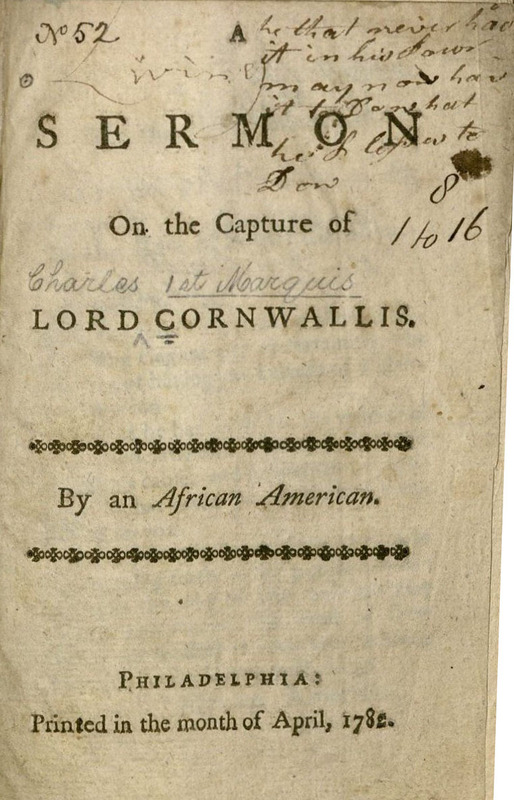 A 16-page pamphlet entitled A Sermon on the Capture of Lord Cornwallis is notable for the attribution of its authorship to “An African American”. Published in 1782, the book’s use of this phrase predates any other yet identified by more than 50 years. The find was first reported in an article in the New York Times, and a followup piece gives more background information. The book was also the subject of a segment on MSNBC’s The Last Word with Lawrence O’Donnell. We’ve just sent the pamphlet to be fully digitized, and we’ll update this post as soon as it’s available.